"Bountiful", by Todd Porter and Diane Cu was the cookbook that housed the recipe for this AMAZING kale salad. If you are at the point, like I was, where you just can't fathom seeing another kale salad in January, please try this salad before you give up. This salad is quite frankly one of the best kale salads I've ever had - and I've had many. 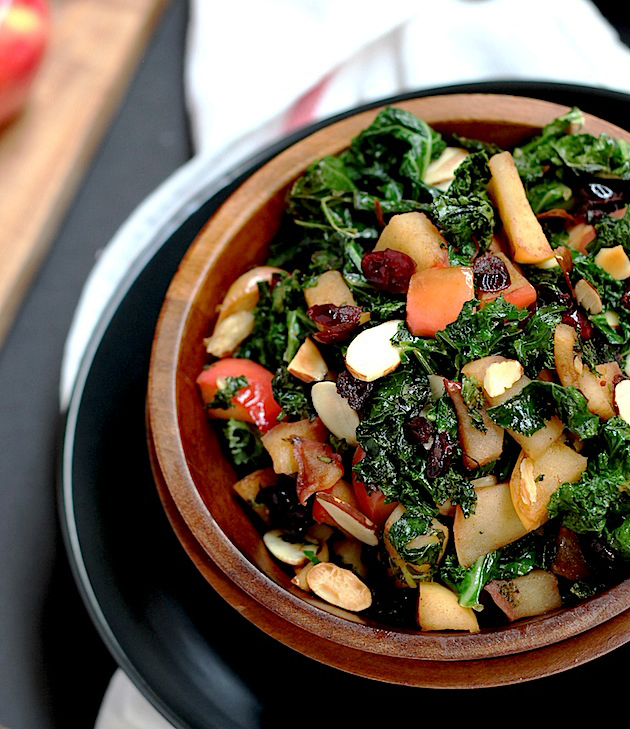 It's made with just a few simple, in-season ingredients that perfectly compliment the kale. 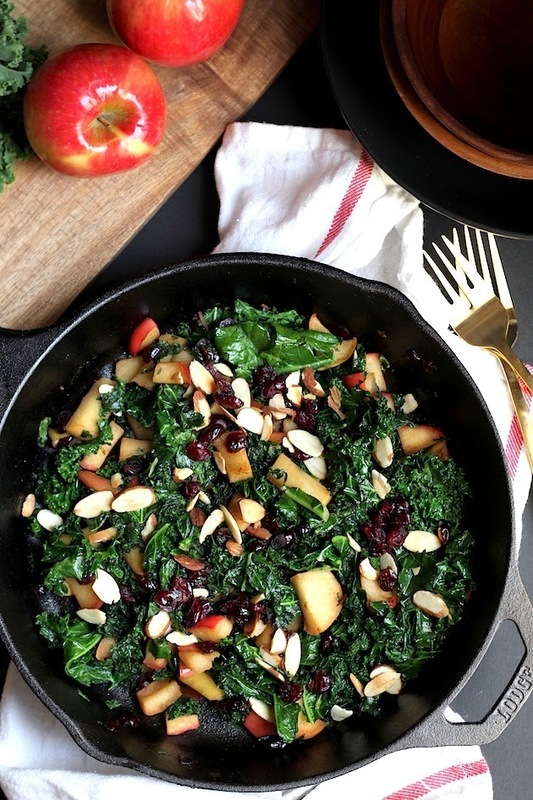 The tartness of the apples and cranberries along with the crunch of the almonds and the warmth of the cinnamon are PERFECTION with the kale. I would never pair cinnamon with kale, but it is heaven in the salad. This salad is best served warm (which I absolutely love), and doesn't require any salad dressing. You know a salad is good when you don't need any dressing. It's also very versatile. It could be a great side dish or lunch - served with quinoa or diced chicken for added protein, or in a wrap. I did the wrap thing and it was quite delish. See below... Don't give up on the kale salad I tell ya... Not before you try this one. 1. Add the almonds to a 10 to 12 in. skillet over medium heat. Toss them around until they are slightly browned. Your nose will tell you when they are ready. Place the toasted almonds in a small bowl and set aside. 2. Add the butter to the same skillet. Keep the heat on medium. Once the butter has melted, add the apples, cranberries, salt, and cinnamon. Saute for about 8 minutes, or until the apples are soft. 3. 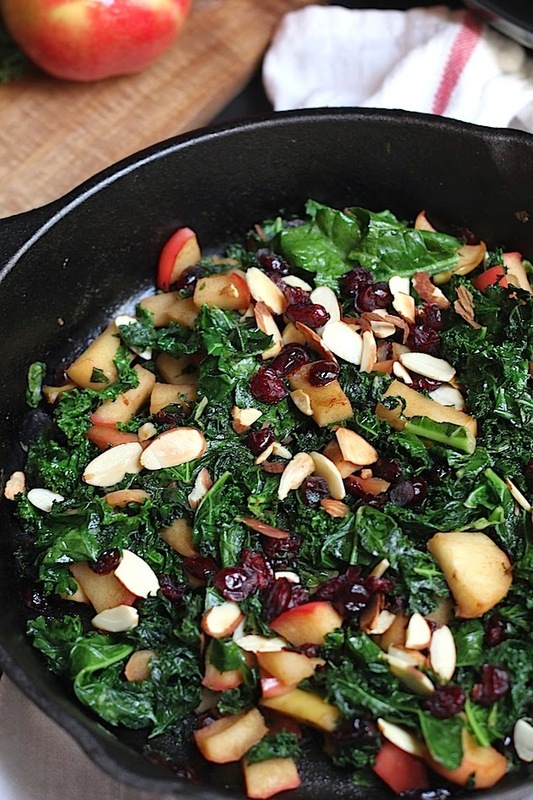 Add the kale to the skillet and toss it around using tongs until it is wilted and tender. 4. Add the salad to a bowl and sprinkle it with the toasted almonds. Serve warm. You can also add it to a whole wheat wrap. Warm the wrap in the microwave for about 10 seconds. Add the salad to the wrap. Top it with feta cheese, wrap it up, and serve! 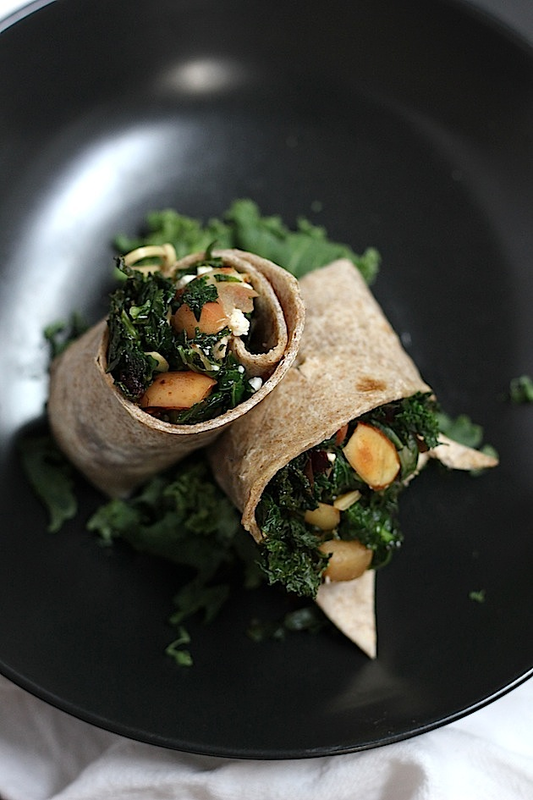 This kale salad looks and sounds delish! Can't wait to try it myself! This salad looks totally yummy! It's nice how you presented this salad in two ways. It looks yummy. I tried it and it was AMAZING!!! i can't wait to make it again! !